This example will load a list box of documents from a network share. It will then allow the user to select the file to print from the browser. 1. 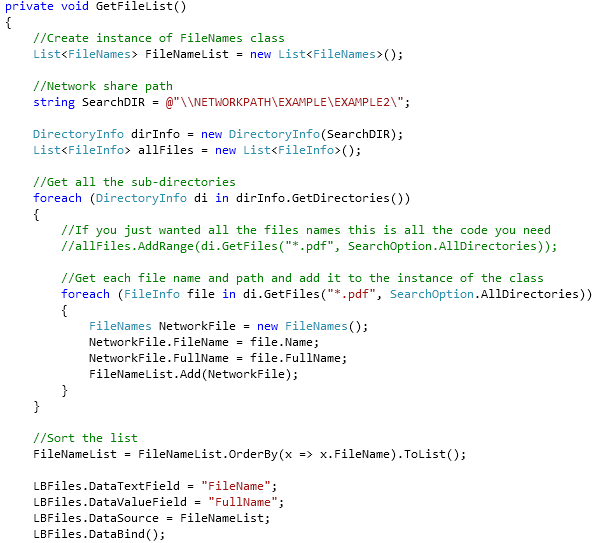 Create a class that contains the name of the file and full path and file name. This will later be used to add to a generic list. 2. Create a method that will read all the sub-directories and file names to load to a list box. 3. When the user selects an item from the list render open the document (example a PDF) in from the browser. For an example of how to render an object (PDF, Word, ZIP...) to the browser for opening see this post.